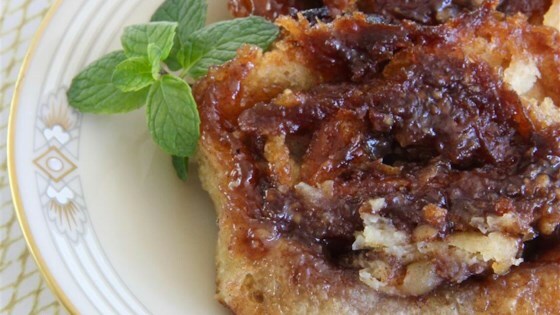 "A good combo of apple pie and cinnamon rolls for the ones with a sweet tooth. Top with whipped cream!" Roll 1 can of crescent rolls out on a cutting board. Make one single piece of dough by rolling the dough with a rolling pin to a 9x13-inch rectangle; make sure the seams don't separate. Repeat with remaining can of crescent rolls. Set 1 dough sheet atop the other to make a double crust. Mix 1/2 cup white sugar, brown sugar, cinnamon, crushed walnuts, and diced apples in a bowl. Sprinkle evenly over the dough. Roll the dough lengthwise, so you end up with a long tube. Cut into 1-inch slices. Place the rolls into prepared dish facing up. Melt butter with 1 1/2 cup white sugar in a saucepan over medium-high heat. Cook and stir until sugar dissolves completely, about 5 minutes. Remove saucepan from heat and whisk citrus-flavored soda into the butter mixture; pour over cinnamon rolls. Bake in preheated oven until golden brown and no longer doughy in the middle, about 30 minutes. Set aside to cool slightly, 5 to 10 minutes. Flip the rolls out of the baking dish onto baking sheet and allow the sticky sauce to drip over the rolls. I will definitely make it again...DELICIOUS!